Created with Sketch.Remy Marketplace Coming Soon - Request Early Access! Remy gives organizations the ability to manage their regulatory relationships and associated activities with ease. Streamline the management of regulatory and compliance related activities on our easy to use platform. Gone are the days of lost documents, missed deadlines and wasted time. Manage audits, licenses, consumer complaints and other high-touch initiatives in one central location. Use Remy to create a command center that works for you. Leverage our intuitive dashboards, actionable notifications and comprehensive audit trail to become a smarter, more agile organization. Improve enterprise wide collaboration efforts of regulated and high-impact activities. 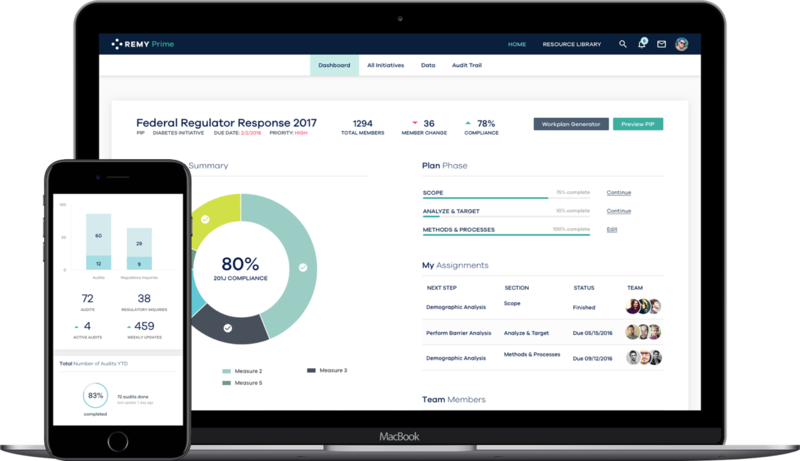 Our platform allows you to quickly respond to regulatory inquiries, rule modifications and compliance program updates. Become a more agile, risk aware organization. Reduce rework while saving time and money. Remy captures institutional knowledge, turning it into an asset and your competitive advantage. 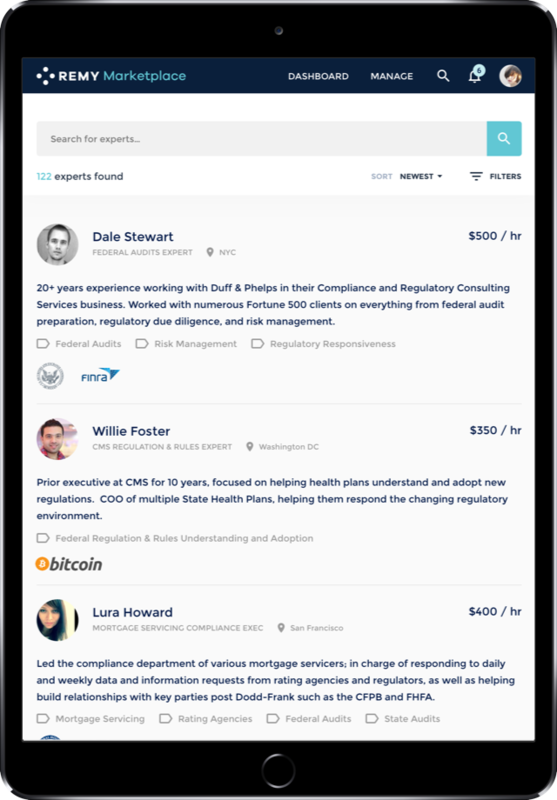 Use the RemyMarketplace to find on-demand experts to assist you in navigating your industry’s complex and ever-changing regulatory environment. Proactively manage your organization’s license portfolio and consumer complaints by geography and type, ensuring you stay up-to-date on current and future requirements. In the Remy Marketplace you'll find on-demand experts who are ready to help you navigate your industry's complex and ever-changing environment. Manage your compliance workload, quickly respond to regulatory pressures, and connect directly with regulators. Remy is a cloud-based platform that simplifies the management of regulatory relationships.